Though originally built by Colovians, the catacombs below Greenhill Church have burial chambers for each of the three local races. Khajiiti bury their dead much the same way the Imperials do; the Bosmer, of course, bury only their skeletons. Greenhill is a riverside settlement in northern Reaper's March, southwest of Arenthia. Despite its Colovian origins and Second Empire architecture, it is now firmly part of Valenwood and ruled by Treethane Bowenas. Although the Church has been abandoned since the fall of the Second Empire, religious tolerance is the norm in Greenhill and the Green Pact is enforced less strictly than elsewhere in Valenwood. 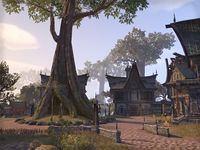 As a result, most of the townspeople, including Bosmer, work in the large vegetable fields and apple orchards which lie between the town and the river. Greenhill Objective: Discover what evil has come to Greenhill. On the Doorstep: Investigate the evil strangers in Greenhill. Ezreba's Fate: Help a local Treethane solve a difficult situation. Prior to completion, this location uses the Fort icon instead of the Town icon.